Renewable energy technologies are cheaper than nuclear plants, safer than nuclear plants, and now they generate more energy than nuclear plants too. “For the first time ever in Europe, renewables produced more power than nuclear – and solar power was key in achieving this remarkable achievement,” according to Michael Schmela of SolarPower Europe. Countries around the world installed solar panels at record-breaking pace in 2014 to bring total capacity to 100 times the level it was at the start of the millennium. Britain was at the helm in Europe, and is on track to retain first place this year too. This milestone shows us that Britain can power itself with largely through renewable energy, without taking a nuclear gamble. Why should we choose solar panels over nuclear power plants? Nuclear plants are, in comparison to coal, low-carbon. But there remain a number of compelling reasons why policymakers prefer solar panels and wind turbines to nuclear power plants. Another problem is the production of nuclear waste, which takes tens of thousands of years to decay. By 2020, we’ll have 140 tonnes of plutonium – what the BBC describes as the “biggest non-military stockpile in the world.” This necessitates investing in tough security measures to prevent deadly nuclear materials from falling into the wrong hands. The most radioactive waste produces enough heat to corrode all containers, and would kill anyone exposed to it for more than a couple of days. Some waste can be reprocessed, but the only long term solution we currently have is burying it under the ground. It’s for this reason that few people consider nuclear to be a sustainable option. Perhaps most importantly from the government’s perspective, nuclear has turned out to be a very expensive method of producing energy. The company that is building Hinkley C, the UK’s latest nuclear plant, is treading water after running into immense financial difficulties building plants in Finland and France. Unfortunately the building underway in England is based on the same model that has so far been a complete failure on the continent. Critics say that Hinkley C the most expensive object ever built, and of course it is the British taxpayer that has footed the bill once again. This doesn’t even cover the cost of decommissioning a plant once its lifespan is up, which can be just as expensive as construction. The cost of decommissioning Sellafield nuclear plant has completely spiralled out of control. What’s next for solar energy? While the latest nuclear plants are getting more and more expensive, the cost of solar panels is going in the other direction. “New wind and solar power systems can generate electricity up to 50% cheaper than new nuclear power plants,” according to Patrick Graichen of Agora Energiewende. A study conducted by Prognos AG concludes that a system of renewable energy technologies supported by natural-gas power plants to overcome intermittency would be 20% cheaper than constructing more nuclear power plants. Overtaking nuclear is an impressive milestone for renewable energy – one that would have been unimaginable five years ago. Overtaking coal is the vital next step. Be part of a brighter future. 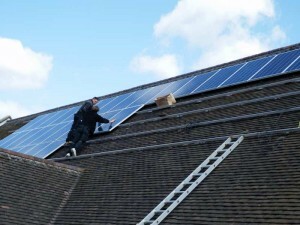 Install solar panels in Essex with Complete Renewables today. Posted on August 21, 2015 August 21, 2015 by Clive Rolison	in Renewable Energy Blog. Tags: Commercial Solar Panels Essex, Renewable Energy Developers Essex, Solar Hot Water Maintenance Essex, solar panels essex, Solar Panels Installer Essex. From zero to hero: explosive solar panel growth means that renewables now produce more power than nuclear in the UK. UK solar output almost doubled last year in Britain, with solar panels installed on buildings and land unsuitable for farming producing enough energy to power 2.4 million homes. If solar energy continues to grow at the current rate, its output will match the world’s power demand in just eighteen years time. How much energy do solar panels produce in the UK? On one record-breaking day in July, the country’s 709,000 solar installations supplied 16% of the UK’s electricity demand. This is an enormous success for a country that barely had solar panels five years ago. Britain has demonstrated its potential to become a dominate player in the global solar market, providing jobs, a return on investment, and cost-effective electricity at home. But the competition is fierce. Other countries not traditionally known for their environmentalist thinking have woken up to the possibilities of solar. India and China will each have 100GW installed by 2022. By making better use of our largest unused rooftops on warehouses, factories and supermarkets, solar power in the UK can exceed even the Department for Energy and Climate Change’s expectations. An independently verified plan from the solar trade association has solar power providing 7% of the UK’s electricity on a daily basis in 2020, outcompeting fossil fuels on price, and providing 57,000 jobs across solar and solar-related industries. Carrying out this plan would eliminate subsidies for solar panels and cost household’s just £13 each on their energy bills. And it’s not just the solar trade association that are reading the writing on the wall. The International Energy Agency’s (IEA) latest forecast is that renewable energy will produce more power than coal within fifteen years, and Saudi Arabia’s own oil minister has predicted the end of oil by the middle of the century. Deutsche Bank estimates that the global solar market will be worth $5 trillion by 2035. Solar panels are getting cheaper and better – having seen a 70% price drop in five years. These improvements combined with improvements in energy storage and the implementation of “smart grids” that respond efficiently to consumer and supplier demands, we could soon be powering our country without polluting it. Aside from the obvious financial and environmental incentives, there are numerous compelling reasons to invest in a solar future. The solar industry is much more home-grown than other energy industries. That means when we spend on solar, more of that money stays in the UK than if we spend on nuclear technology or off-shore wind, both of which require more parts, technology or labour to be imported from outside of the country. Producing energy in the UK would also free our politicians from wrangling with dubious Russian or Middle-Eastern fossil fuel suppliers. It’s very difficult for the UK to condemn Vladimir Putin’s involvement in Crimea, for example, when by purchasing his coal we contribute to the cost of his army. Then there is the voice of the British people to consider. Solar panels enjoy a greater than 80% public support levels across a number of opinion surveys, making them more popular than the government and much less controversial than nearby nuclear plants, fracking or wind turbines. Be part of the solar success story. 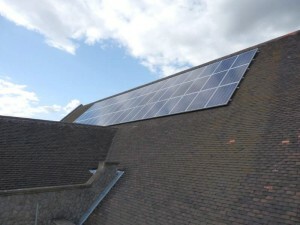 Install solar panels on your Essex building and reduce your energy bills. Posted on August 12, 2015 August 21, 2015 by Clive Rolison	in Renewable Energy Blog. Tags: Commercial Solar Panels Essex, Renewable Energy Developers Essex, Solar Hot Water Maintenance Essex, solar panels essex, Solar Panels Installer Essex. David Cameron’s agreement to end fossil fuel usage by the year 2100 is an admirable and long-awaited goal. Installing solar panels on public properties could be key to its success. But the recent success of government and local council projects suggests that we have been missing out by overlooking the possibility of solar panels on public buildings. How did Newcastle Council reduce carbon emissions by 22% since 2005? Three years ago, North Tyneside Council partnered with E.On to install 1,500 PV solar panels on buildings in Newcastle. The scheme was a huge success, reducing C02 emissions in the area by a tonne. Private companies such as E.On are happy to take on the upfront cost because they make their money back by selling excess electricity to the grid, while locals enjoy lower energy bills to the tune of £150 each year. Have solar panels on public properties been a success elsewhere? London Mayor Boris Johnson has been criticised for failing to get the ball rolling on solar panels for schools in London, despite the fact that most of the capital’s 3,000 schools could accommodate at least a 25 kWp system. Money saved on a school’s energy bills has the potential to do exceptional good – because it frees up funding for teachers, books and computers. While the charity 10:10 has been doing excellent work with its crowd-funded ‘solar schools’ project, the majority of suitable schools are still not making the most of their roof space. Boris Johnson has since attempted to fix this issue by confirming that funding will be set aside for solar PV on public buildings in London, including schools, though commentators are less than impressed by his track record on the issue. What’s next for solar panels on public properties? It seems likely that we will see a lot more currently unproductive land put to use generating electricity – and profit – for the government. Indeed, the government has announced plans to install 1GW of solar power on government land. The first project, recently completed at a Ministry of Defence (MOD) training facility, will produce 40 MW of electricity at the site. Half of the energy will power the indoor training facilities, while the other half will be exported back into the national grid to generate revenue for the MOD. The site, which cannot be sold to a private company nor be put to agricultural use due to poor soil quality, is an excellent example of another win-win situation for solar panels on public land. Interested in your own win-win solution? Complete Renewables are the leading solar panel trade suppliers in Essex. We also fit air source heat pumps in Essex and the surrounding area. Posted on July 24, 2015 August 21, 2015 by Clive Rolison	in Renewable Energy Blog. Tags: Commercial Solar Panels Essex, Renewable Energy Developers Essex, Solar Hot Water Maintenance Essex, solar panels essex, Solar Panels Installer Essex. It looks like millions more could benefit from falling energy bills and generous subsidies, which is great news for homeowners and PV solar panel installers in Essex and across the UK. What do her comments mean for the future of solar panels in the UK? The announcement is good news for homeowners that are thinking of having solar panels installed. The Conservatives did not mention solar panels in their 2015 manifesto, which lead to some anxiety amongst environmentalists. But commentators are taking this announcement from Rudd as a signal that subsidies for solar panels will continue. Is the government committed to renewable energy technology? The new government has a mixed attitude towards renewable energy. London Mayor Boris Johnson announced that the new government would “certainly” be the “greenest ever,” yet at the same time the Conservative manifesto contains a pledge to “halt” the development of onshore wind farms. Likewise, Rudd’s announcement suggests that the government will continue to support rooftop solar panels, but makes no mention of large scale solar farms, which were often attacked by the Coalition. Most ambitiously of all, David Cameron and the other G7 leaders agreed that the use of fossil fuel should be phased out by the end of the century – but stopped short of signing a legally binding pledge. Energy minister Lord Bourne indicated the government’s position on renewables by stating that “we need more clean and home-grown sources of energy, which will help to reduce our reliance on foreign fossil fuels.” As solar thermal installers in Essex, we couldn’t agree more. Is now the best time to buy solar panels? Based on the available evidence, it looks like now is a very good time to buy solar panels. Solar panel prices have fallen massively. In 2010, putting a small solar panel system on your roof would have cost £15,000. But today even the largest solar panel system would cost much less, most likely somewhere in the region of £6,000. Indeed, the Daily Telegraph recently found that now is the best time to buy solar panels since 2010. This is Money, financial website of the year, found that installing solar panels results in an average 10% tax-free return on investment. In certain properties in Essex and the sunny South-East, the return could be even higher. If you install solar panels in Essex before the July review, you may be eligible for a higher rate of payment. We are also well known air source heat pump suppliers for Essex and beyond too. Find out more today. Posted on July 10, 2015 August 21, 2015 by Clive Rolison	in Renewable Energy Blog. Tags: Commercial Solar Panels Essex, Renewable Energy Developers Essex, Solar Hot Water Maintenance Essex, solar panels essex, Solar Panels Installer Essex. We can’t live our modern lives without energy, yet at the same time many people are furious when developers look to build energy generators in the local area. What’s the solution? Meanwhile, Lightsource Renewable Energy Ltd are looking to build two further smaller solar farms that’ll power more than 1,500 homes near Hackmans Lane. It’s essential that we strike the right balance between meeting our energy needs and preserving our countryside. To meet our energy demand we need to produce substantial amounts of energy. Unfortunately, the production of energy through fossil fuels creates dangerous byproducts, known as greenhouse gases. Climate scientists are in unanimous agreement that we need to transition to a low-carbon economy in order to prevent the most serious effects of climate change. As solar technology develops, it becomes much cheaper to produce solar energy. The Solar Trade Association predicts that the cost of solar energy will be lower than the price of gas energy three to five years time. Solar panels can be a vital component of our country’s energy mix, but we have to build them somewhere. How can we minimise the impact of solar panels? One way to minimise the visual impact of solar panels is to put them in a place that we don’t often use or look at. Did you know that there is a quarter of a million hectares of completely unused southward-facing space in England with no ecological value whatsoever? I’m talking about rooftops, of course, specifically factory and warehouse rooftops. Putting solar panels on just these roofs would go a long way toward meeting the energy needs of homes across the country. Remember, that’s only industrial roofs we’re talking about and only the southward-facing ones. Not a single blade of grass would be trampled. That’s not to mention public buildings such as schools or hospitals, or the million homes that already have solar panels installed. The problem is that it is more expensive to put solar panels on roofs than it is to have them freestanding in a field. This means that companies like BE Renewables Ltd will continue to look for cheaper (but greener) places to install their solar panels, and councils like Thurrock will continue to delay. It’s up to us as a country to decide what our priorities are – then put our money where our mouth is. We install solar panels and renewable energy technology at competitive prices in Essex and across the South East. Talk to an engineer today on: 01621 827015. Posted on June 22, 2015 August 21, 2015 by Clive Rolison	in Renewable Energy Blog. Tags: Commercial Solar Panels Essex, Renewable Energy Developers Essex, Solar Farms in Essex, Solar Hot Water Maintenance Essex, solar panels essex, Solar Panels Installer Essex. What’s the idea behind solar panels for schools? If every family who has a child at Eastwood Primary School puts in just a couple of quid, then the school would be able to install solar panels and make MASSIVE savings on their energy bill. Not only that, but the school will even earn an income on renewable energy generated thanks to the government’s nifty Feed-In Tariff. They’ll be able to plough their savings straight back into education, meaning more books and computers for the kids. Can solar panels help schools to teach children about protecting the environment? Schools are where most children learn about how they can protect the environment through recycling and energy efficiency. But they can also be a place where children can learn about energy efficiency, sustainability and solar power. By installing solar panels and cutting their carbon footprint, schools can be an inspiration for the next generation. Do you want to know the best part…? The schools need to raise £8,000 by the end of the summer. That’s a lot of money for a little school, but hardly anything if the cost is shared by the community. Eastwood Primary has signed up to Solar Schools, which is a crowdfunding platform that has already put solar panels up on more than 20 schools across the country. The children themselves have done plenty of fundraising already – including a cake sale, writing to local businesses and dressing up as rays of sunshine. You won’t believe how cute their promotional video is! 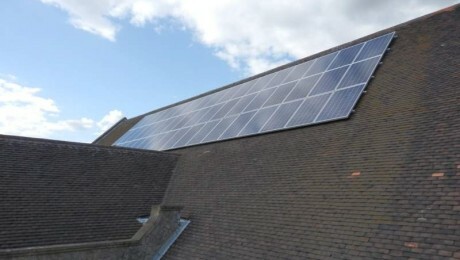 We install solar panels on homes, schools and businesses across Essex. Contact us today to find out more. Posted on June 4, 2015 August 21, 2015 by Clive Rolison	in Renewable Energy Blog. Tags: Commercial Solar Panels Essex, Renewable Energy Developers Essex, Solar Hot Water Maintenance Essex, solar panels essex, Solar Panels Installer Essex. Are ‘Free’ Solar Panels A Good Idea? Some companies are offering the free installation of solar panels in exchange for a generous slice of surplus energy pay. But in some ways this deal is too good to be true. Market researchers have found that demand for solar panels has grown dramatically since 2010. Three months ago we wrote that 50% of homeowners are considering installing solar panels. That number has now risen to 60%. Homeowners considering installing solar panels shouldn’t wait around; the Daily Telegraph has found that right now is the most profitable time to have solar panels installed. Those who want solar panels have two main options, pay for installation themselves, or look out for a company offering ‘free’ solar panels. There’s no such thing as a free lunch, but what about free solar panels? What do homeowners stand to gain from a ‘free’ solar panel scheme, and do the benefits outweigh the costs? What’s the deal with ‘free’ solar panel schemes? ‘Free’ solar panel schemes, or rent-a-roof schemes, are offered by companies that are seeking to make a profit from the Feed-in Tariff (FIT). The FIT is a government policy which guarantees payment in return for generating electricity with renewable energy technology, including solar panels. Some enterprising companies are taking advantage of the FIT by leasing rooftops from homeowners for twenty to twenty-five years, in exchange for installing and maintaining solar photovoltaic (PV) panels on it. The homeowner pays nothing upfront, and benefits from the ‘free’ electricity that is generated, while the company pockets the FIT. Why is it better to install your own solar panels? As the Guardian has reported already, free solar panels are good, but buying solar panels yourself is better. This is because the companies that are installing ‘free’ solar panels earn more through the FIT than the homeowner does through the reduced energy bills. Homeowners who can pay for solar panels themselves, and take all of the profits, should do so. If you can’t afford to pay for your own solar panels it becomes a little more complicated. There’s a good chance that borrowing money through a personal loan and installing your own solar panels is a better financial decision than getting ‘free’ solar panels, though that would depend on the terms of your loan. The government’s ‘Green Deal’ is an excellent example of a loan that would enable you to buy solar panels with a very generous repayment schedule. You could even make money on solar panels by remortgaging your home, though you should check all of the available alternatives thoroughly before doing so. There is another thing to consider when weighing up whether you should have ‘free’ solar panels installed. To really make the most of the electricity generated by the solar panels, you’ll have to change your lifestyle so that your appliances are working in the middle of the day when the sun is shining. This would benefit stay-at-home mums, retired people and remote workers the most. If this is impractical because you work away from home during the day, you can install a timer on your appliances and set them to work when electricity is cheapest. Stipulate that you may not sell your house. Stipulate that you cannot get a loft conversion. Force you to payout if the panels need to be temporarily removed for roof work. Remember to get legal advice from a trustworthy professional before you sign anything. Also remember that if you sell your house, you’ll need to find a buyer who is comfortable taking on the lease – although they should be at least be happy with the reduced electricity bills. Lastly, double check who will pay for insurance and maintenance. In most cases the company should be responsible. Or, rather than deal with the potential headaches of leasing, take advantage of the competitive pricing here at Complete Renewables and buy your own solar panels. Check with a professional before leasing your rooftop. Talk to us on 01621 827015 and let us make you a better offer. Posted on May 18, 2015 August 21, 2015 by Clive Rolison	in Renewable Energy Blog. Tags: Commercial Solar Panels Essex, Renewable Energy Developers Essex, Solar Hot Water Maintenance Essex, solar panels essex, Solar Panels Installer Essex. Due to falling installation costs, the Telegraph finds that now is the most profitable time to install solar panels. Did you invest in a “dot com” company like Google early in the 90s? Or were you able to snag a London property back in ‘96 when the price was right? Making the right financial decision at the right time can completely turn your life around, but unfortunately it’s normally difficult to know when the best moment to buy is. However, a team of experts from the Daily Telegraph have found that right now is the best time to buy solar panels because installation prices are low and government payouts are in a perfect balance. But it’s important to strike while the time is right because installation costs may not continue to fall, and the government is likely to rethink its renewable energy policy at some point after the general election. According to figures from the National Energy Saving Trust, the price of solar panels has fallen considerably in recent years. In June 2012, the average solar panel costed £8,400, that’s £1,500 more than the figure from September 2014, which was £6,800. In fact, it is £5,000 cheaper to buy a solar panel today than it was five years ago. But the rate at which the price of solar panels is falling has slowed. According to experts, homeowners should buy now, because while the technology may get cheaper, there is no guarantee that the price will fall dramatically in the future. Under the Feed-in Tariff (FIT), homeowners are paid for every unit of energy that they generate, which is fixed at the current rate on the day that they signed up for their panels. Currently, the income is guaranteed for twenty years. For example, someone who signed up today would earn just under 14p for every unit of electricity generated by their panels until 2035. According to data from the Daily Telegraph, a typical solar panel set will installed in the summer of 2012 will net the homeowners £226 taxfree annually for the next quarter century – paid directly into their bank accounts by the energy company. Of course, the FIT is only half the equation, the other half is a reduction in energy bills which also helps to make solar panels so lucrative. However, the government is likely to reassess the FIT later this year. Experts expect the FIT to be cut, because it is reviewed on a three-monthly basis and changed depending on how many solar panels have been installed. With the government on target to reach a million solar panels on British rooftops by the end of this year, it’s fair to say that the FIT payments will fall. This is because the idea behind the FIT is to encourage the solar industry until the technology is cost-effective without a subsidy, a target that the industry is fast approaching. If you think that subsidies for any energy companies are deeply unfair, then you should take a look at the fossil fuel and nuclear industries, which receive an enormous amount more in government subsidies. Unlike the solar industry, the fossil fuel industry shows no signs of being able to survive without a subsidy in the future. Party politics may also have a role to play in the economics of solar panels. Unlike the Labour party, the Conservatives failed to mention solar panels in their 2015 manifesto. Commentators have noted that this is not a good sign for the solar industry, should the current government be reelected in May. Is Waiting For Cheaper Solar Panels A Good Idea? Based on the two points that we have examined, the plateauing of installation costs and the likely drop in FIT payments, it could be dangerous to play the waiting game. Savvy homeowners will order their solar panels now, while FIT payments are secured at a generous level and installation costs are a fraction of what they were only a few years ago. Remember, certain factors can lead to an even bigger return. A south-facing roof in Essex, for instance, gets considerably more sunshine than the national average. It’s also the case that those who are at home during the day and use electricity when the sun is shining will benefit even more. Buy solar panels now, while the outlook is brightest. Get a quote from Compete Renewables. Posted on May 8, 2015 August 21, 2015 by Clive Rolison	in Renewable Energy Blog. Tags: Commercial Solar Panels Essex, Renewable Energy Developers Essex, Solar Hot Water Maintenance Essex, solar panels essex, Solar Panels Installer Essex. What Do Scientists Really Think About Climate Change? Most people believe that scientists are uncertain whether climate change is caused by human behaviour. This couldn’t be further from the truth. We don’t have time to learn about every single important issue that affects our daily lives. While we might like to know exactly how the food we eat affects our body, how the laws being passed will affect our society, or how human action is affecting climate change, finding the right answers takes a huge amount of careful research. That’s why it is a sensible idea to trust the opinions of experts who have spent their lives devoted to finding the correct answers. So what do climate scientists think about climate change? According to a recent study, 97% of climate scientists agree that climate change is real and caused by human action. That number was reached by an analysis of 12,000 peer reviewed papers. These papers represent an overwhelming body of evidence that tells us that our use of fossil fuels, such as coal, oil and gas, are affecting our planet in a way that will have serious repercussions for life as we know it. The consequences of climate change have already been measured by NASA. They report a loss of sea ice, accelerated sea level rise and longer, more intense heat waves. These factors are influencing the way that people are able to live and farm worldwide. But the predicted consequences of climate change have more serious ramifications because scientists are sure that temperatures will continue to rise for the foreseeable future. The most serious of these are the destruction of coastal cities due to rising sea levels and elevated risks of famine due to crop failure. What can we do in Essex to help prevent climate change? You might be surprised by the amount of carbon dioxide and other greenhouse gases that are emitted by relatively small areas, such as Essex’s own Chelmsford. An average person in Chelmsford has a carbon footprint of roughly 13.36 to 15.51 tonnes of carbon dioxide. To put that into perspective, that’s the equivalent of filling 36 million balloons with carbon per person. Fortunately, there are steps that we can easily take to reduce our carbon footprint. In order to reduce our carbon footprint to a safe level, we need to move towards a power supply that is made up mainly or entirely of renewable energy technology. Renewable energy technologies, such as solar panels, ground source heat pumps and air source heat pumps, are more reliable, more affordable and more effective than ever before. The more widespread use of solar panels in Essex alone would lead to a reduction of thousands of tonnes of carbon in the atmosphere. By adopting renewable energy technologies, we can all reduce our carbon footprints to a level that is safe for ourselves, our children and our planet. Help prevent climate change now. Talk to a renewable energy specialist: 01621 827015. Posted on April 27, 2015 August 21, 2015 by Clive Rolison	in Renewable Energy Blog. Tags: climate change, Renewable Energy Developers Essex, Renewable Energy Installer Essex, solar panels essex. 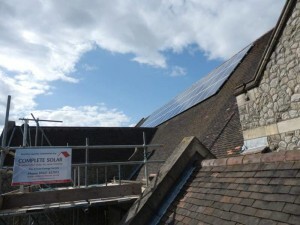 Over the last year we’ve been working with Crowstone St. George United Reformed Church to install a 12.5 kW system. Larger projects such as these are necessarily more complicated and so can take some time to complete. In the case of Crowstone church, there were various internal factors which added to consultation time prior to installation process. Such factors are based on board approval, general announcements/notice time and revenue raising. During this time we are often called on to provide more information and even sometime present information to various groups. We’re always happy to take this time to do this. We appreciate that when many people are involved, and when the interests are broader than a private installation, it pays to take the time to ensure that every aspect is covered. The installation itself was for an array of 50 250W panels, with an estimated yield of 10,730kWh per year. The Feed-In tariff is available for commercial entities for an amended amount. This still represents a great investment. For commercial organisations the Feed-In tariff will provide a significant long-term revenue yield. Installations of this type are also popular for farmers, supermarkets and most large buildings. Whereas domestic households use most electricity during the evening and at weekends, commercial premises generally use their power during the day. This can represent significant saving as less power is returned to the grid and instead used on site. As you can image installing 50 panels on a historic church’s roof involves a great deal of responsibility and careful treading. Scaffolding was installed to ensure that our workmen had easy access to all aspects of the church’s roof. Furthermore we took great care when working with tiles of this age. We are happy to report that the church installation was a resounding success. The job was completed in under a week, in keeping with our agreed timetable. The system is currently running and generating a healthy return for the church. Posted on May 8, 2013 by Clive Rolison	in Renewable Energy Blog. Tags: church, church solar panels, commercial feed-in tariff, essex, farm solar panels, feed-in tariff, solar panels, solar panels essex.